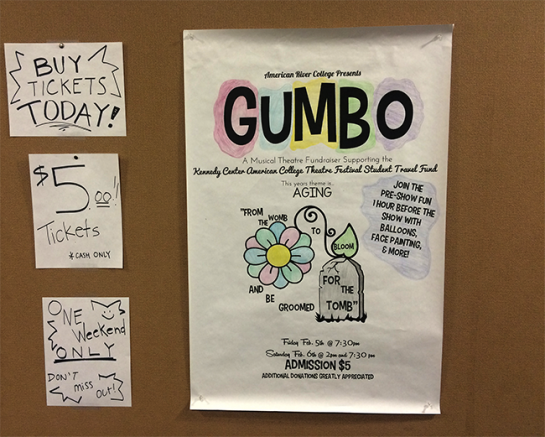 American River College’s theater program is hosting a performance of ‘Gumbo’ to help students raise money to fund travel to a regional competition. The fundraiser will be held on Stage 2 of the American River College Theater today at 7:30 p.m. and tomorrow at 2:00 p.m. and 7:30 p.m. Admission to the event is $5 and additional donations will be accepted toward funding. “It is going through the stages of life, from birth, to childhood, and through adulthood, ending with senior living and death,” said Juliana Nassr, a performer in the show. The play explores the intricate journey of aging through song, dance and drama and each performer will play different roles throughout the production. ‘Gumbo’ is known as “guerilla” theater and is created by several different artists, as opposed to a regular theater production that focuses on a core group of artists. “The show is created as we go on,” explained Annelies Veldman, an ARC theater major and Gumbo performer. “(It) combines the performers’ talents of singing, dancing, acting, improvisation, musicianship, writing, spoken and sign language to create a theatrical bonanza,” said director, theater professor and actor Samuel Williams. Williams has been teaching, directing and choreographing at ARC since 1998. ‘Gumbo’ was an original idea created by Williams’ daughter, Sarah Williams who just returned from a trip to New Orleans. Emalie Powers, an ARC theater major and ‘Gumbo’ performer, said she was excited to be a part of the production because of its different style of theater. The show was created and rehearsed in about 4 weeks and contains around 25 performers. The money is being raised for the Kennedy Center American College Theatre Festival Student Travel Fund. Veldman and about two dozen other students are traveling to Colorado to perform in various competitions and attend multiple conferences and workshops. ARC students leave for the festival on Feb. 14. 1 Comment on "ARC hosts fundraiser performance of ‘Gumbo’"